There’s nothing like listening to the soft tinkle of wind chimes on a breezy day! You can buy all kinds of wind chimes but it’s fun to make your own. Especially if you can upcycle or repurpose material you already have to make one. 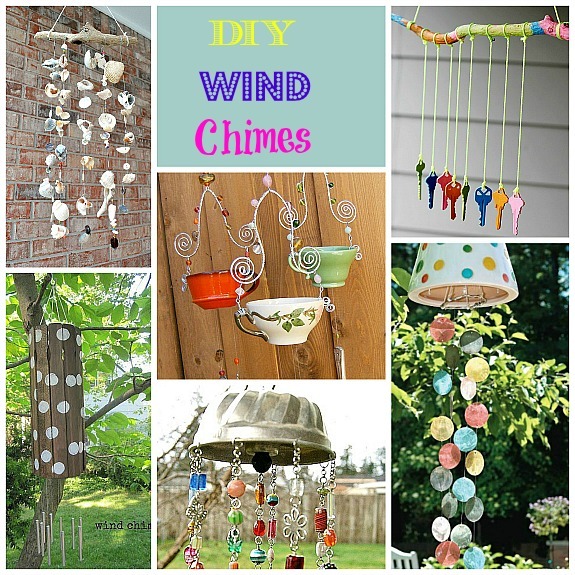 I found 8 DIY Wind Chimes that I think are very creative to share with you! 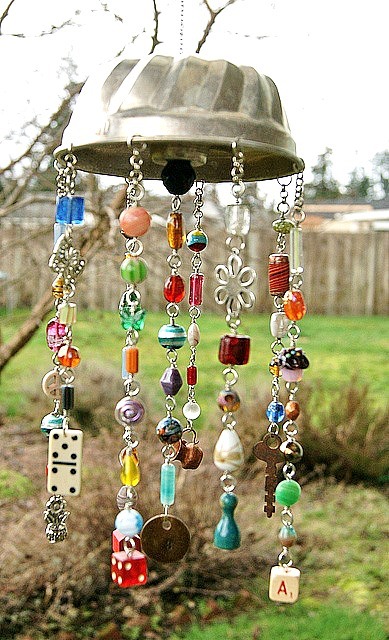 This fun wind chime from HA! Designs re-purposes a jello mold as the main piece. So cute and I love how you can use up little odds and ends of things! 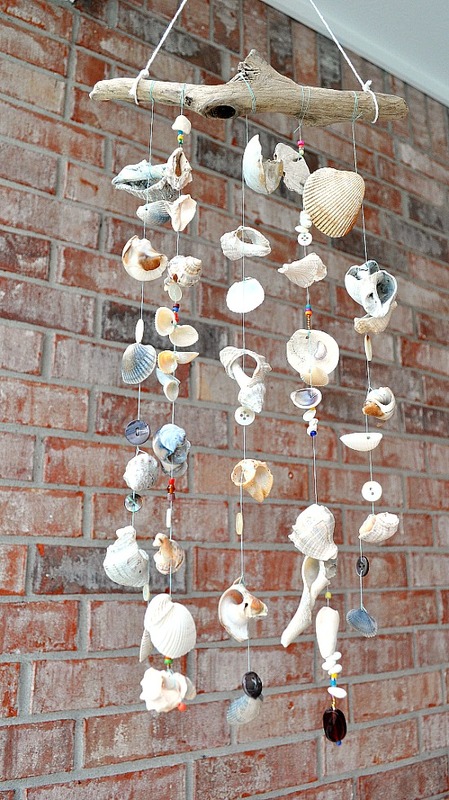 These DIY seashore wind chimes from Home Sweet Home Made would be a great way to use shells you find on vacation. 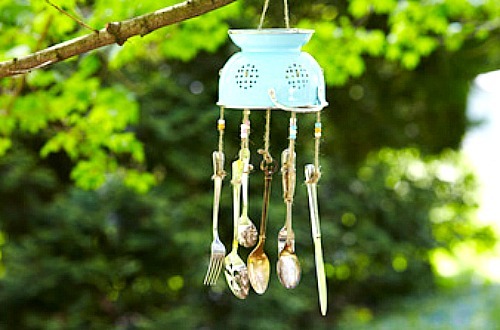 Home Made Simple has an easy to follow tutorial for making this cute silverware wind & colander wind chime. Save those bottle caps and upcycle them! 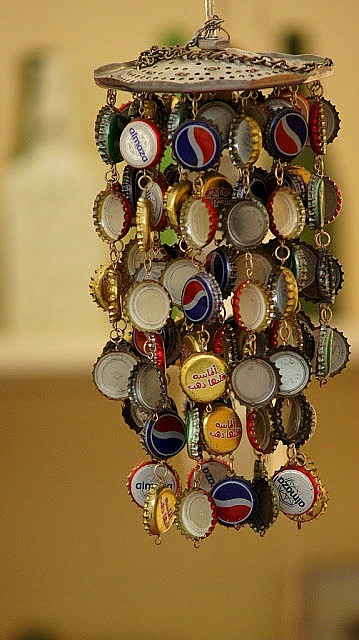 A cute bottle cap wind chime (photo credit Pianista.9). Trina is Artsy has a tutorial for how to make one. 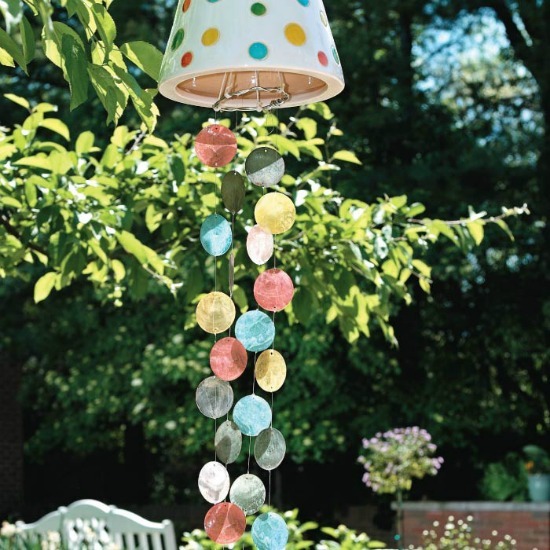 This last wind chime is a cute and easy one even kids can make. I love all the different colors for the keys! 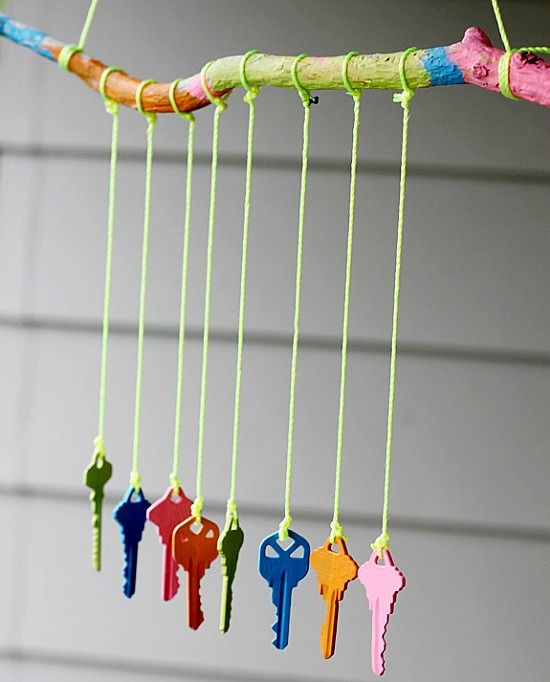 Check out Inner Child Fun for the tutorial on how to make this upcycled key wind chime. 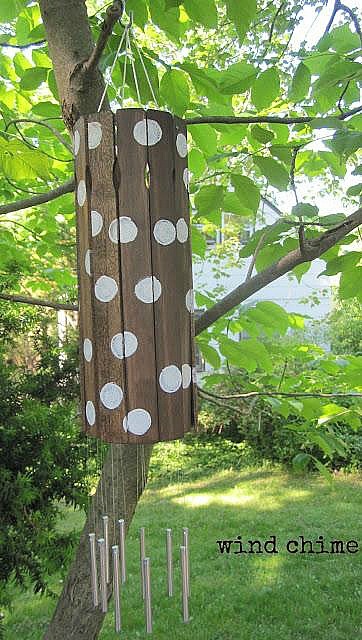 I hope these ideas get your creative juices flowing and inspire you to use what you may already have to make your own wind chime! Little know factoid: The sound of wind chimes is my favorite sound in the world. (The voices of my family don’t count.) It ranks just slightly above the sound of a fife and drum. Not that anyone cares or anything, but I love them, and now you have me wanting to actually make some of my own. I never have. I always buy them. GREAT ideas! Thanks for sharing, I am gonna get the supplies together to make one with the kids! Wonder which one they would like to make? So many choices! Have a blessed day dear Manuela, HUGS! What great ideas. I think I might make the one with the colander and silverware and hang it on our almost finished deck off from our dining room. What great ideas! Thanks for sharing with us. Love the key one. So original. Each one is so cute! They all look so cute and I would enjoy having them in my garden for looks alone. 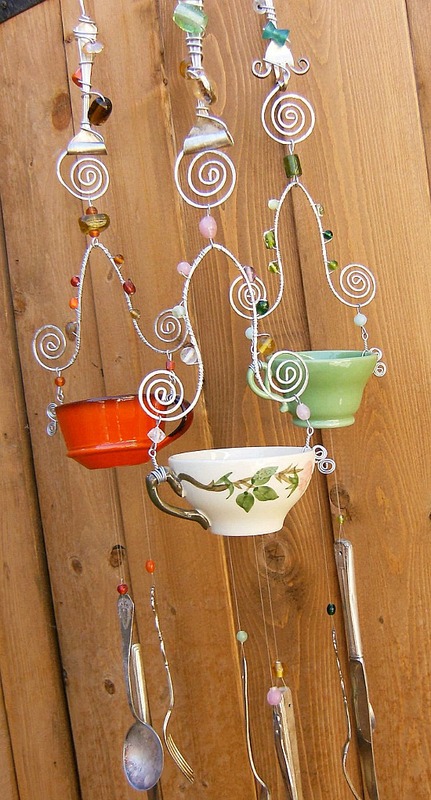 I do love a musical windchime so, if I made these, I’d make sure that it would be unlikely for them to clank. That would probably be a challenge. Those are all great ideas, Manuela, I love the key one, very cute and colourful! All the chimes are really pretty; I like all the different motifs and can’t decide which I like best!! I enjoyed these, thanks for sharing! Love them all – perfect for summer! The colors alone make me smile! Each one of these is so cute! 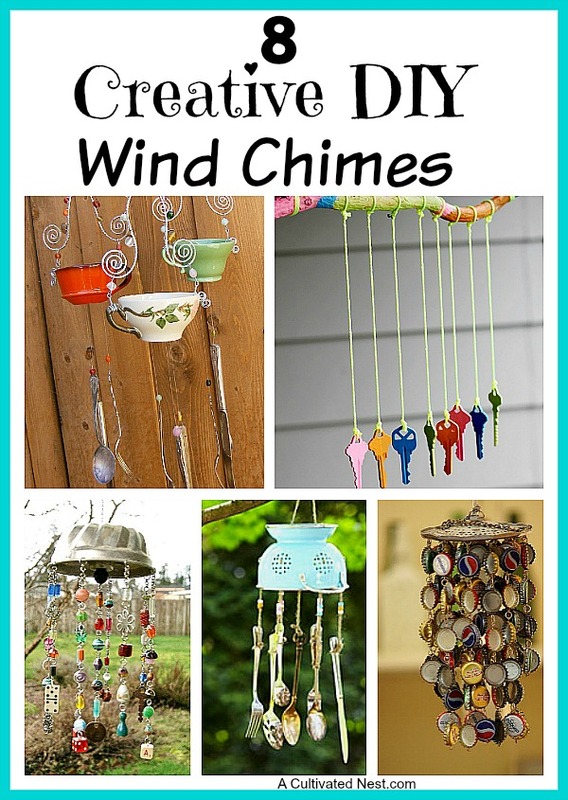 I love wind chimes and you have certainly given me some inspiring ideas! I love the jello mold, and the bottlecap chimes the most…how fun!